Consider a company selling the ubiquitous widget. An average order for widgets is worth £15 and the net profit on "Wonder Widgets" are £7.50. The net profit on "Widget Deluxe" is £8.25. You might decide you can pay £5 to acquire a customer and make a £2.50 or £3.25 profit depending on the product purchased in that sale. The numbers are confusing and don’t give a clear insight into profitability unless you start to address the sales of each product and the spend required to reach customers for each item. However, if you are able to calculate the customer lifetime value, you might learn that each customer is actually worth an average of £25 to your company with repeat orders. Now you can market more aggressively to potential customers. You can pay easily as much as £7.50 per new customer.That figure lets you actually break even on the initial sale of £15 given a net profit of £7.50. Longer term the income from each new customer is £25, with a cost of customer acquisition of £7.50, that’s £17.50 we can expect to earn from each new customer. £25 would be one and two thirds widgets with production cost of £12.50, a customer acquisition cost of £7.50. So costs would total £20 we’d therefore earn £5 from the customer. As most of your competitors won’t be thinking of the lifetime value of their customers, they at worst might mirror some of your advertising & marketing and then quickly stop when they calculate that they are breaking even or losing money on a sale. A side effect of new business also tends to be that your marketing costs reduce and the cost of doing business is lowered as increased purchasing power lowers the wholesale price and manufacturing costs. 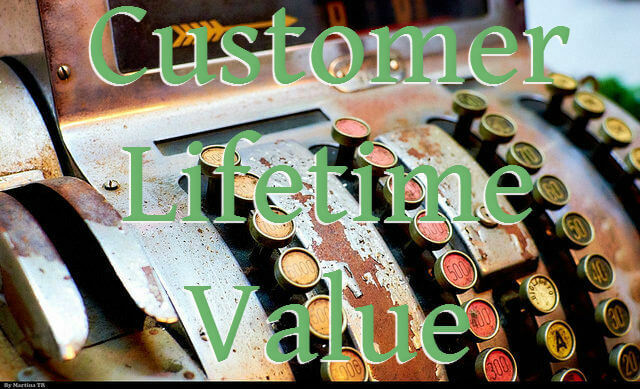 By knowing the lifetime value of each new customer you can more aggressively pursue new business and stay ahead of the competition.